Recently, I have been working in a project which it was required to audit all the database transactions including the username. For this purpose I have been using Hibernate ORM Envers, which aims to enable easy auditing/versioning of persistent classes. In order to show how to use Hibernate Envers in this post I have built a sample project, based on this Spring boot JPA project. Spring Boot makes it easy to create stand-alone, production-grade Spring based Applications that you can “just run”. In this case it is very handy because it includes: an embedded tomcat,’starter’ POMs to simplify your Maven configuration, and REST web services ready to use. This post is structure in 5 simple steps, neverthelesss, the last 2 steps are only useful if you would like to add the username (or any other information) to your revisions. In order to be able to audit your entity tables, you only need to have an entity with a primary key and use the annotation @Audited. You can use the annotation @Audited either at the top of the class (that will audit all the fields of the class) or only in the fields that you would like to audit. Once you add the @Audited annotation you will see that a new table with the suffix “_AUD” will be created for each entity. Also you will find that a new table called REVINFO, which contains all the revisions information, has been created. By default this table will only contain the id of the revision and the timestamp, although on section 4 and 5 I will show you how to add more data to this table, like the username. In this case we will automatically have in our database 2 tables, one called City and another one called City_AUD which will include all the city fields plus a revision identifier and a revision type (creation, update, delete). If you have already configured Hibernate Envers into your project, now every time that you add or update an object into the database you will see that another row will be added to the audited table. Now we would like to get the different revisions for a specific object. Transactor is a custom class for running a piece of code in a single transaction. As you can see in the checkRevisions function, we are using the AuditReader for getting the different revisions for the same city. The AuditReader has more methods which will make you easier to look for any revision, please have a look to the api for more information. The Revision entity is the class which contains the data that you would like to audit in each transaction. It is mandatory that this class contains a revision number and a revision timestamp, either you can add these 2 fields manually or you can extend the DefaultRevisionEntity class which already contains them. Note that the class contains the @RevisionEntity(UserRevisionListener.class) annotation. The revision listener is the class where you need to specify how to populate the additional data into the revision. This class needs to implement the RevisionListener interface which has only one method called newRevision. In this example, I am auditing any transaction with the same username (“SUAY”), but in a real environment you should get the username from a User service or any other method that you use to log the users. //This return a list of array triplets of changes concerning the specified revision. // The array triplet contains the entity, entity revision information and at last the revision type. //In this case we want the entity revision information object, which is the second object of the array. All the code used in this post is available in github. If you would like to run the project, you just need to run the main methon in SampleDataJpaApplication. Thanks a lot! This is exactly the information I needed. You really saved me a lot of work, since I was going to implement the auditing myself. How to let the reader work in a spring contect? I found the solution of my own problem. Please let me know if you have any other comments or queries. Where do you save the username? I add the two classes you mentioned and I don’t find where is it saved. Should’t be in revinfo? The username should be saved in the UserRevEntity table. Depending of your hibernate configuration this column will be added automatically or you will need to add it manually. In my case, I have set in the hibernate config file the property ddl-auto to “update”, that means that the column is added automatically, if it is not there. Please let me know if you have any comments or queries. I had similar question – username wasn’t filled in. My answer is yes it should be REVINFO that will have username column. I quickly solved problem, easily, by adding in persistence.xml REVINFO entity. Once JPA found it there, it started to work. Somewhere along the way, JPA decided to change column names to another defaults. Hi, when i try to do something similar in my project i get an entityManager is closed error when i try to use AuditReader. Its not clear to me why you don;t get that problem and i do ! do you have any guidance on how i should debug this ? Hi Chris, coukd you give me more information about your project. Are you using Spring? J2EE? I guess your problem is how you are retrieving the entity manager and injecting it into the AuditReader. Hurrah, i managed to solve the problem… i have a spring boot project but when i run the code in the project it works. Only when i was running it as a Junit test was it failing. BY making the test method @Transactional seemed to solve the problem. Im not 100% sure why but clearly it stops the session from closing. Thanks for the example. But I have a different scenario. I want to audit such that the student_AUD table should have columns like this..
and whenever any information related to address or education is updated or deleted the data should be persisted in the student_AUD table itself and new AUD tables for address and education should not created. I am using MySQL, Spring boot and hibernate envers. Unfortunately, hibernate envers only supports table-per-entity strategies. So I changed the version of hibernate-envers to 5.2 and it ran fine. But Audit tables are not getting created.. Thanks for letting me know the problem with the dependencies. I have just downloaded the project again and it runs fine in my machine but it could be because I have that dependencies stored in the m2 repository in my machine. Also I run the application and the tables were created. Please let me know if that helps or you are still having issues. Entity has no primary key attribute – How did you manged this issue with @Entity annotation on UserRevEntity? Seems the property id on DefaultRevisionEntity is private. But I have an Issue if you don’t mind to help. 2017-02-09 14:47:09,810 [localhost-startStop-1] ERROR org.hibernate.engine.jdbc.spi.SqlExceptionHelper.logExceptions(SqlExceptionHelper.java:146) – Database ‘dbo’ does not exist. Make sure that the name is entered correctly. I’m really getting crazy with this error. If I set the prop to “create”, some of the tables lose all their data, especially the ones containing many to many relationships. Finally, you need to be very careful when you use “create” as you pointed out, it will remove all the data from your database and create a new one each time you run your application. Thank you a lot! It’s help for me. Hi. I cloned your project and ran it. I am getting empty tables for _AUD tables. Can you tell me why and how to fix it ? Firstly, thanks for the article. It’s pretty useful. I’ve set it up on my spring-boot project. 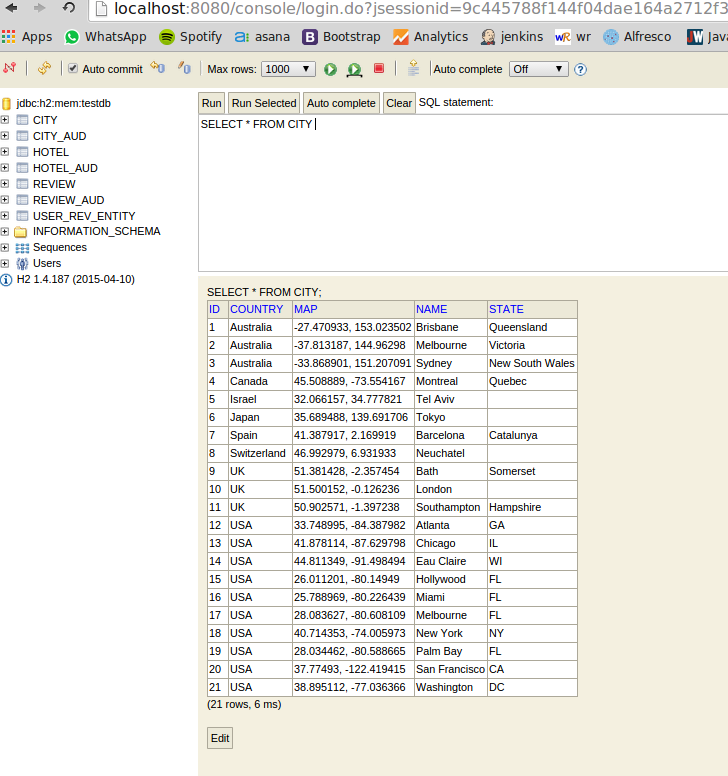 I’m using spring data jpa’s crud repository for my db transactions. For those transactions, wherever, I use the repository methods like save, update, delete I’m able to get entries in _aud tables ,but, for some custom repository methods where i’ve written JPQL queries with @Query annotation, I’m not able to get entries in aud and rev tables. Could you please share your views on this? Whether it is feasible or not?